I had this book on my shelf for over a year before I decided to finally read it. I don't even remember why I finally decided to read it. I was probably bored, but most likely I didn't want to do any work and wanted to escape from it all. I had never heard of Helon Habila prior to reading this book, and after I read it, there was just something about Habila's voice and the way he interwove culture, history and tradition. Measuring Time tells the story of twin brothers, Mamo and LaMamo, brought up by a controlling father in northeastern Nigeria. LaMamo, the fearless twin, becomes a soldier fighting in various West African wars; while, Mamo, the twin with sickle cell, stays in Keti. The story pays more attention to Mamo and his life in Keti once his brother leaves, while LaMamo appears intermittently, mainly through his letters to Mamo. This is an amazing book, which I would highly recommend. I actually had it on my shelf for like 2 years before i got around to reading it.That is usual with me. However when i finally read it, I felt I read it just at the right time because I doubt I would have enjoyed it as much as I did if I read it at any other time. 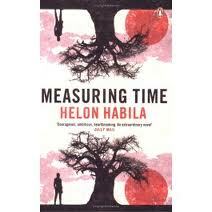 Habila is an assertive and sure,yet simple story teller.